March 1 (Bloomberg) — Past may be no prologue for Treasury investors when Federal Reserve policy makers begin to withdraw their unprecedented monetary stimulus without raising interest rates. For the first time since at least 1980, a change in monetary policy may mean the difference between short- and long-term Treasury yields will widen rather than narrow. The threat of the Fed selling the $2.29 trillion in securities on its balance sheet, combined with record Treasury auctions, will keep longer-term yields higher, according to Deutsche Bank AG, one of 18 primary dealers that trade directly with the central bank. A so-called steeper yield curve would boost borrowing costs for companies and home buyers while attracting money managers deterred by record-low rates. President Barack Obama needs to lure investors more than ever as Treasury extends average debt maturities and finances a budget deficit that the government predicts will expand to an unprecedented $1.6 trillion in the fiscal year ending Sept. 30. The yield curve, or the gap between 2- and 10-year Treasury note rates, widened to a record 2.94 percentage points on Feb. 18, before narrowing to 2.80 percentage points on Feb. 26. Yields on 2-year notes fell 10 basis points to 0.81 percent last week. Those on 10-year securities dropped 16 basis points to 3.61 percent even after the government sold a record $126 billion in notes and bonds. Ten-year notes yielded 3.63 percent today as of 9:23 a.m. in Tokyo, and the curve spread was unchanged. The Fed’s anchoring of its target rate for overnight loans between banks to a range of zero to 0.25 percent since December 2008 and record borrowing by the Treasury pushed the gap up from nothing in June 2007. Deutsche Bank forecasts the curve will steepen to 3 percentage points as 10-year note yields climb to 4 percent by mid-year. Morgan Stanley expects 3.25 percentage points by the second quarter, with the 10-year note reaching 4.5 percent. Investors would earn about $415,400 on a $10 million sale of 10-year notes combined with a $42 million purchase of two- year notes if the gap increased by 50 basis points, assuming two-year yield holds steady. The yield curve narrowed last week after the Fed raised the discount rate charged on direct loans to banks to 0.75 percent from 0.50 percent. The move increased investor focus on the next policy steps, after the central bank added more than $1 trillion to its balance sheet through emergency loans and securities purchases following the September 2008 bankruptcy of Lehman Brothers Holdings Inc.
Fed Chairman Ben S. Bernanke said last week that the change in the discount rate doesn’t mean the central bank is preparing to boost its target rate. In his semi-annual testimony to Congress, Bernanke reiterated that rates will remain low for “an extended period” because the economy’s “nascent” recovery isn’t strong enough to bear higher borrowing costs. The economy expanded at a 5.9 percent annual rate in the fourth quarter, the fastest pace in six years, a report showed Feb. 26. Fed officials forecast the economy will grow 2.8 percent to 3.5 percent this year. Still, the central bank is looking at ways of wrapping up the measures required to unlock credit markets. It expects to complete $1.43 trillion in purchases of mortgage-backed securities and housing agency debt this month and finished a $300 billion Treasury purchase program in October. Four emergency lending facilities were closed last month. Policy makers are preparing to begin draining the more than $1.1 trillion in excess bank reserves they have pumped into the banking system by paying interest on deposits or using repurchases agreements with bond dealers. The Fed’s assets now consist of about $777 billion of Treasuries, $166 billion of agency debt and more than $1 trillion of mortgages, central bank figures as of December show. When it starts selling, the supply of longer-term securities will increase. The average maturity of the Fed’s Treasury holdings is about seven years, according to Fed data. Policy makers debated in January how to shrink the balance sheet, with some pushing to sell assets in the near future, minutes of the Jan. 26-27 Federal Open Market Committee meetings show. Bernanke and his colleagues agreed that the assets and banks’ excess cash will need to be reduced. They also said the central bank should dispose of mortgage and related securities purchased to support banks when credit market seized up. Fed officials “kept open the option of outright asset sales, suggesting that the curve steepening pressure would be maintained even as the Fed moves closer to an exit policy,” said Mustafa Chowdhury, head of interest-rates research in New York at Deutsche Bank, who correctly predicted in October that two-year notes would outperform 10-year securities even as policy makers began to consider how to pull back monetary stimulus measures. A steeper curve provides more potential for profits at U.S. banks in so-called carry trades. JPMorgan Chase & Co., Bank of America and Citigroup Inc. boosted holdings in mostly fixed- income securities by an average of $35.5 billion in 2009’s second half, company filings show. Financial shares in the Standard & Poor’s 500 Index rose 81 percent in the last year. The yield curve usually flattens when the central bank starts increasing funding costs. During the three months preceding or following the first interest-rate increase in Fed’s tightening cycles since 1980 the yield curve flattened, data compiled by Bloomberg show. When the central bank last began lifting rates in June 2004, the spread narrowed from 1.9 percentage points to 1.51 percentage points by September. The gap was 2.27 percentage points in March 2004. In the decade before the credit markets seized up, 10-year Treasury yields averaged 0.81 percentage point more than two-year yields. “We are really treading on unchartered territory through all of this,” said Christopher Sullivan, who oversees $1.6 billion as chief investment officer at United Nations Federal Credit Union in New York. Sales by the Fed would come as the Treasury lengthens the average maturity of its debt to a range of six to seven years. The average due date dropped to a 26-year low of 49 months at the end of 2008 after the U.S. sold $1.9 trillion of short-term securities during the credit crisis. Lower 10-year yields would help keep a lid on mortgage rates as the central bank completes purchases mortgage-backed and housing agency securities. The difference between yields on Washington-based Fannie Mae’s current-coupon 30-year fixed-rate mortgage bonds and 10-year Treasuries was about 0.71 percentage point at the end of last week, just above its smallest since at least 1984, according to data compiled by Bloomberg. Yields on Fannie Mae and Freddie Mac mortgage securities guide U.S. home- loan rates. Longer-term borrowing costs for the highest rated corporations have already increased. Investment-grade corporate bonds pay the highest yields relative to benchmark rates since September 2007 compared with shorter-maturing notes, according to Bank of America Corp.’s Merrill Lynch index data. Investors demanded 1.92 percentage points in extra yield to own debt due in at least 10 years, compared with a 1.68 percentage point spread for notes due in three to five years, the data show. The 0.27 percentage point gap on Feb. 9 was the largest since Sept. 14, 2007. As was the case during the last shift to tighter monetary policy in 2004, the curve will begin flattening when a Fed increase becomes imminent, said Adam Kurpiel, an interest rate derivatives strategist at Societe Generale SA in Paris. Fed fund futures traded on the CME Group in Chicago on Feb. 26 gave a 32 percent chance the Fed will raise the benchmark lending rate by the end of September, down from 51 percent a week earlier. 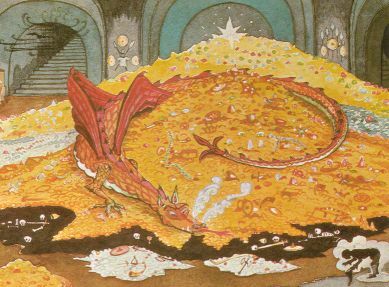 (Reuters) – The author of an article that said China had confirmed it would buy 191.3 tons of gold from the International Monetary Fund said on Friday she didn’t have official sources for her story. Nobody was available to comment on Friday at China’s State Administration of Foreign Exchange, the arm of the central bank overseeing gold reserves. The unverified report helped push up gold prices by 1 percent on Thursday, though other commodities fell, under pressure from a stronger dollar. Traders cited the talk about China as a significant factor why gold prices clawed higher. A yet to be verified story from Rough & Polished, a Moscow based website, reported that China had “confirmed its decision to acquire 191.3 tons of gold auctioned by the International Monetary Fund.” Of course, until official confirmation comes from China, no one will really know if this story is true or not. However, if true, here’s why this story would be hugely significant to the gold market. One, such a purchase would give more validity to the theory that China, with a vested interest in the price of gold today, is willing to intercede and support gold prices whenever they are being attacked by the US Federal Reserve and Bank of England through their manipulation of fraudulent gold futures markets in London and New York. Two, it would further support exposing the gold futures markets in London and New York as nothing more than a gold fractional reserve playground that allows the western banking cartel to manipulate gold prices. The last available Commitment of Traders reports indicated that the Commercials were short 663.83 metric tonnes of gold. This position is supposed to be fully deliverable by the Commercials should the offsetting longs ask for delivery. Even though the Commercials very likely hold some of the offsetting longs through spread positions, that short position still represents a ton (no pun intended) of gold – gold, that according to COMEX regulations, must be available for physical delivery. However, if an incredibly large tonnage of physical (not paper) gold were really available for purchase on the COMEX, why would China feel an urgency to take delivery of a mere 191.3 tonnes of gold now through the IMF? Could it be because India “scooped” them the last time the IMF made a gold sale and China does not wish to be left twisting in the wind again with very little physical gold available for delivery in the global futures markets? If the China IMF gold story were true, the above would be plausible reasons for China acting now rather than later. If it turns out that this story is true, then apparently the Chinese government agrees with me. Also remember that China, as the world’s largest producer of gold, is likely to keep the vast majority of its future gold production in house. Thus if China is still turning to the outside market to buy its gold to buttress its gold reserves in addition to its internal production, then this story is very bullish for the long-term future of gold. Three, if this story is later confirmed to be true, only an inside Chinese source could have leaked this story. No inside source would have leaked this story unless the deal had already been sealed as such pre-sale information would be very detrimental to China as it would lead to a higher purchase price. If this story is true, this again, leads credence to the theories that China now serves as a very important counter to the gold price suppression schemes of the western banking cartel. Remember, as recently as five years ago, the western banking cartel essentially faced ZERO opposition to its price suppression schemes in gold and silver. Thus, the emergence of a powerful opposition force would be a huge development to the gold market. Finally, if this story were confirmed, then this event would likely allow gold as well as mining stocks to form a bottom in preparation for a move higher. Though the agents of the western banking cartel always like to paint gold supporters as a fringe lunatic movement that perpetually believe gold is heading to $10,000 an ounce tomorrow, this is the furthest possible representation of reality. I have always found supporters of gold to be among the most well informed people in the world in regard to understanding how stock market and futures manipulation schemes operate versus those that remain blind to this reality. And this is exactly what has happened thus far. Though we are not yet out of the woods in terms of this current gold and silver correction, the China story, if confirmed, could be the trigger to put in the bottom of this current correction. Of course, if this story later turns out to be unfounded, then it may trigger a continued temporary, albeit likely brief, further slide in gold prices. In conclusion, though on the surface China’s yet to be confirmed purchase of gold from the IMF seems to be just a passing note unworthy of attention, if it turns out to be true, we may very well look back at this event as marking a crucial turning point in the gold market. A fortnight or so after his “ultimate bubble” quote hit the headlines, it emerges that George Soros has actually more than doubled his investment in gold. He now owns some 6.2 million shares in the US-listed gold exchange traded fund, SPDR Gold Trust (NYSE: GLD), worth some $680m. 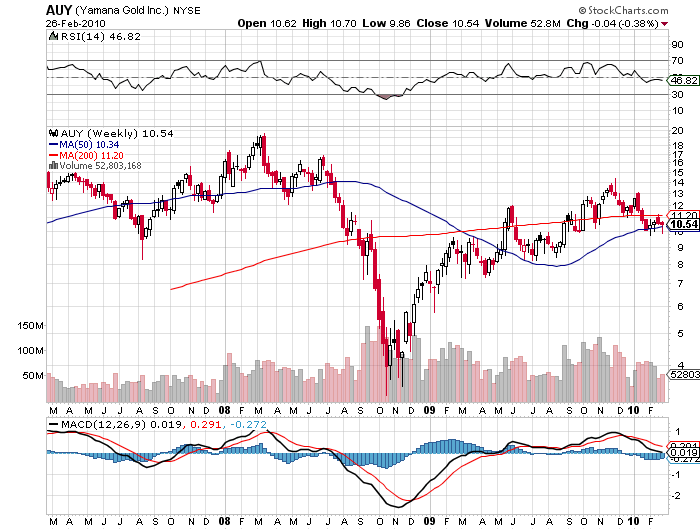 His investment vehicle Soros Fund Management also increased its holding in the Canadian gold miner Yamana (LSE:YAU) . WHEN the Sloan Digital Sky Survey started work in 2000, its telescope in New Mexico collected more data in its first few weeks than had been amassed in the entire history of astronomy. Now, a decade later, its archive contains a whopping 140 terabytes of information. A successor, the Large Synoptic Survey Telescope, due to come on stream in Chile in 2016, will acquire that quantity of data every five days. Such astronomical amounts of information can be found closer to Earth too. Wal-Mart, a retail giant, handles more than 1m customer transactions every hour, feeding databases estimated at more than 2.5 petabytes—the equivalent of 167 times the books in America’s Library of Congress (see article for an explanation of how data are quantified). Facebook, a social-networking website, is home to 40 billion photos. And decoding the human genome involves analysing 3 billion base pairs—which took ten years the first time it was done, in 2003, but can now be achieved in one week. All these examples tell the same story: that the world contains an unimaginably vast amount of digital information which is getting ever vaster ever more rapidly. This makes it possible to do many things that previously could not be done: spot business trends, prevent diseases, combat crime and so on. Managed well, the data can be used to unlock new sources of economic value, provide fresh insights into science and hold governments to account. But they are also creating a host of new problems. Despite the abundance of tools to capture, process and share all this information—sensors, computers, mobile phones and the like—it already exceeds the available storage space (see chart 1). Moreover, ensuring data security and protecting privacy is becoming harder as the information multiplies and is shared ever more widely around the world. “We are at a different period because of so much information,” says James Cortada of IBM, who has written a couple of dozen books on the history of information in society. Joe Hellerstein, a computer scientist at the University of California in Berkeley, calls it “the industrial revolution of data”. The effect is being felt everywhere, from business to science, from government to the arts. Scientists and computer engineers have coined a new term for the phenomenon: “big data”. Epistemologically speaking, information is made up of a collection of data and knowledge is made up of different strands of information. But this special report uses “data” and “information” interchangeably because, as it will argue, the two are increasingly difficult to tell apart. Given enough raw data, today’s algorithms and powerful computers can reveal new insights that would previously have remained hidden. There are many reasons for the information explosion. The most obvious one is technology. As the capabilities of digital devices soar and prices plummet, sensors and gadgets are digitising lots of information that was previously unavailable. And many more people have access to far more powerful tools. For example, there are 4.6 billion mobile-phone subscriptions worldwide (though many people have more than one, so the world’s 6.8 billion people are not quite as well supplied as these figures suggest), and 1 billion-2 billion people use the internet. Moreover, there are now many more people who interact with information. Between 1990 and 2005 more than 1 billion people worldwide entered the middle class. As they get richer they become more literate, which fuels information growth, notes Mr Cortada. The results are showing up in politics, economics and the law as well. “Revolutions in science have often been preceded by revolutions in measurement,” says Sinan Aral, a business professor at New York University. Just as the microscope transformed biology by exposing germs, and the electron microscope changed physics, all these data are turning the social sciences upside down, he explains. Researchers are now able to understand human behaviour at the population level rather than the individual level. The amount of digital information increases tenfold every five years. Moore’s law, which the computer industry now takes for granted, says that the processing power and storage capacity of computer chips double or their prices halve roughly every 18 months. The software programs are getting better too. Edward Felten, a computer scientist at Princeton University, reckons that the improvements in the algorithms driving computer applications have played as important a part as Moore’s law for decades. A vast amount of that information is shared. By 2013 the amount of traffic flowing over the internet annually will reach 667 exabytes, according to Cisco, a maker of communications gear. And the quantity of data continues to grow faster than the ability of the network to carry it all. People have long groused that they were swamped by information. Back in 1917 the manager of a Connecticut manufacturing firm complained about the effects of the telephone: “Time is lost, confusion results and money is spent.” Yet what is happening now goes way beyond incremental growth. The quantitative change has begun to make a qualitative difference. This shift from information scarcity to surfeit has broad effects. “What we are seeing is the ability to have economies form around the data—and that to me is the big change at a societal and even macroeconomic level,” says Craig Mundie, head of research and strategy at Microsoft. Data are becoming the new raw material of business: an economic input almost on a par with capital and labour. “Every day I wake up and ask, ‘how can I flow data better, manage data better, analyse data better?” says Rollin Ford, the CIO of Wal-Mart. Sophisticated quantitative analysis is being applied to many aspects of life, not just missile trajectories or financial hedging strategies, as in the past. For example, Farecast, a part of Microsoft’s search engine Bing, can advise customers whether to buy an airline ticket now or wait for the price to come down by examining 225 billion flight and price records. The same idea is being extended to hotel rooms, cars and similar items. Personal-finance websites and banks are aggregating their customer data to show up macroeconomic trends, which may develop into ancillary businesses in their own right. Number-crunchers have even uncovered match-fixing in Japanese sumo wrestling. “Data exhaust”—the trail of clicks that internet users leave behind from which value can be extracted—is becoming a mainstay of the internet economy. One example is Google’s search engine, which is partly guided by the number of clicks on an item to help determine its relevance to a search query. If the eighth listing for a search term is the one most people go to, the algorithm puts it higher up. To be sure, digital records should make life easier for doctors, bring down costs for providers and patients and improve the quality of care. But in aggregate the data can also be mined to spot unwanted drug interactions, identify the most effective treatments and predict the onset of disease before symptoms emerge. Computers already attempt to do these things, but need to be explicitly programmed for them. In a world of big data the correlations surface almost by themselves. Sometimes those data reveal more than was intended. For example, the city of Oakland, California, releases information on where and when arrests were made, which is put out on a private website, Oakland Crimespotting. At one point a few clicks revealed that police swept the whole of a busy street for prostitution every evening except on Wednesdays, a tactic they probably meant to keep to themselves. But big data can have far more serious consequences than that. During the recent financial crisis it became clear that banks and rating agencies had been relying on models which, although they required a vast amount of information to be fed in, failed to reflect financial risk in the real world. This was the first crisis to be sparked by big data—and there will be more. The way that information is managed touches all areas of life. At the turn of the 20th century new flows of information through channels such as the telegraph and telephone supported mass production. Today the availability of abundant data enables companies to cater to small niche markets anywhere in the world. Economic production used to be based in the factory, where managers pored over every machine and process to make it more efficient. 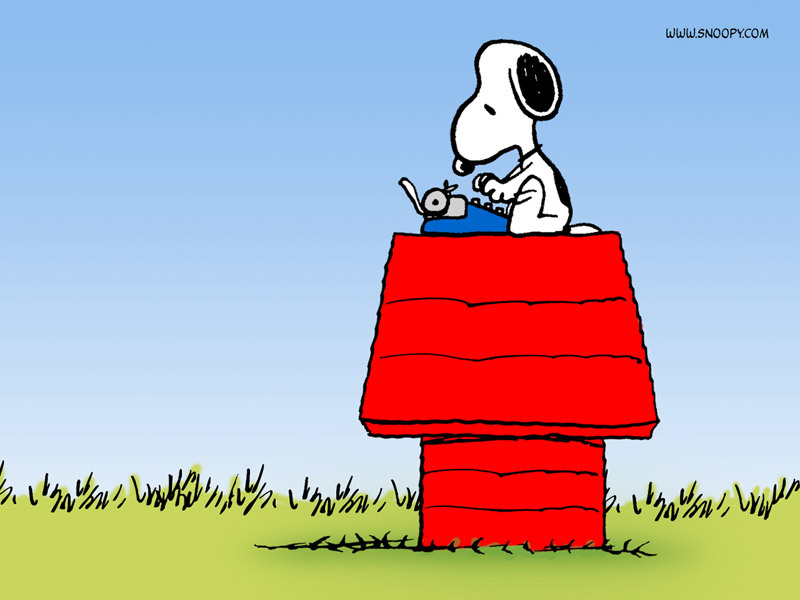 Now statisticians mine the information output of the business for new ideas. “The data-centred economy is just nascent,” admits Mr Mundie of Microsoft. “You can see the outlines of it, but the technical, infrastructural and even business-model implications are not well understood right now.” This special report will point to where it is beginning to surface. Yesterday’s weak Consumer Confidence report has many worried that the consumer is still down in the dumps. If so, no one has told the consumer sectors of the stocks market. 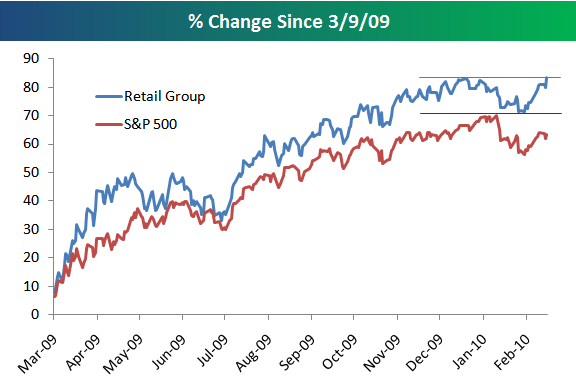 As shown below, the S&P 500 Retail sector actually made a new bull market high today. The S&P 500 still has a ways to go to get back to new highs. While the Consumer Confidence report is indicating a weak consumer, the market still seems to be predicting strength from the consumer. If it weren’t for groups like retail, the overall market would be doing worse. With the fiscal stimulus, and the requirement of humans to consume, the pure rate of interest, has indicated that retail is more profitable than higher stages of production. Quite rationally, investors have bid-up retail based stocks. This is a sign, clearly visiable, of inflation. For those investing/trading in gold, miners, etc, Bernanke’s announcement is good news [for stocks also] as it of course means that the debasement of the dollar is set to continue for the forseeable future. Thus, commodities generally will be inflationary.